Anyways, yesterday I was stressing about all the stuff I had to get done. And I did get some of it done and alot of it went "undone". But, I did make two cards. So, from my perspective, the day was good. The first card....the big layered heart one I am entering into the Lily Pad Patterned Paper Challenge. 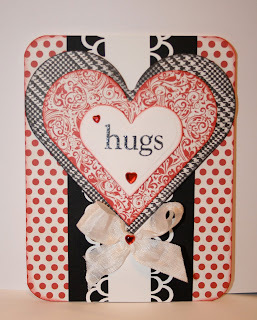 Both sentiments are Hero Arts and the large image is Northwoods Rubber Stamp Co. Thanks for stopping by and and if you got to this sentence, well then, THANK YOU for slogging thru an exceptionally long post! Love your card for the challenge, Sheila- the strip down the center and layered hearts are fab! Love how you colored the image in the second- so pretty! OH gorgeous creations!!!! Sounds like you had some fun but I know what it's like to not get the crafty stuff in because it's such a recharge...as mom's we do put everyone else first...I've started to realize for myself though that when I get my crafty time - I'm a better mom and wife!!! Big ((HUGS)) to you and I'm glad you found some time for your crafty goodness - your creations are BEAUTIFUL! great post Sheila. We do sometimes sabotage our lives. I really love my ME time (although I do tend to take more than my fair share sometimes and don't do the things I should, like the ironing!) Love both your cards so glad you did manage some crafting. Sheila this post is amazing. Thank you for sharing what so many of us feel. Here's to balance, happiness and love! Ah! No worries my friend! It happens to all of us and there are days where I, too, want to craft so badly, and it just simply doesn't happen so I just wait and the opportunity just seems to come when life sees fit! Funny thing, hah? Both of your cards are so gorgeous and I Heart the BIG heart! I love both your cards Sheila! Love the glitteriness on the second card and the BIG heart on the first! I hope that in the posts to come you will be telling us how you are carving some time out just for YOU! It's a necessity! Browsing is addictive and can waste precious time (I do it, I know), and then the guilt about not having time to comment....and more guilt about who knows what else...us women, we are a weird bunch! Reading in a hammock for days definitely sounds like an option! GORGEOUS cards AND photography!! You really knocked it out of the park, Sheila! Your blog post was like reading my own story. I haven't made "me" cards in a long time. I do the same - blog hop all day until it's dinner time. I will say, I have learned a lot!